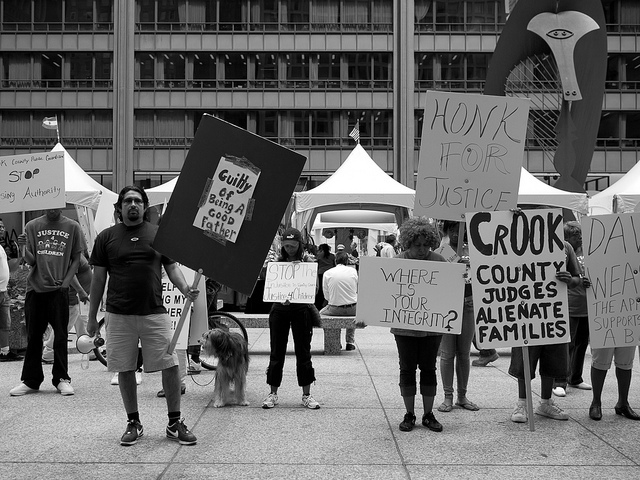 Judges like Judge Haracz in Cook County are typical of how our family court system in the U.S. is in meltdown, plundering families for their profit and to enrich child representatives, court appointed lawyers, counseling agencies, visitation supervision agencies, defaming non-custodial parents, promoting divorce, insisting on family separation and long drawn out proceedings that seriously harm the mental health of children. Judge Haracz abdicates his responsibilities and simply rubber stamps the lies of the child representatives like David Wessel and Regina Scannicchio. How do we know this. Well, we have the pleadings and reports from numerous cases, only one of which we have started to post on this blog. When we finish posting all the evidence, there will be only one thing left – IMPEACH JUDGE HARACZ – he is destroying families. Much much more to follow. Join us in protest August 12, 2011, north side of Daley Center, from 8 am to 5 pm. Show your support for courageous parents like Linda Sacks, David Bambic, Gwendolyn Shavers, Nancy Roulfe and others by standing with us. Follow the pending historic United States Supreme Court case addressing the abuses of Child Protecton Services in divorce cases here. Read the United States Supreme Court petition here. We’re not going to take it anymore! View official protest song for August 12, 2011 nationwide protest August 12, 2011 against corrupt family courts and child protective services, who have diverted billions from social security Title IV funds to enrich judges and court appointed attorneys and child representatives. We are fed up with destruction of families and children by corrupt courts dragging out divorce and child protection cases, ordering unnecessary evaluations, allowing unproven false allegations against a parent to deprive the parent of custody and unsupervised visitation. We demand an immediate stop to payments to these corrupt persons and to denial of due process in divorce and child custody proceedings! Also see link to national protest web site here. The trial court declared me indigent and ordered the court reporter to file a free copy of the transcripts with the court for an appeal. The court reporter has refused to follow the court order. The trial judge refuses to enforce the order because he said he lost jurisdiction to the IL Appellate Court. The IL Appellate court has six time refused to enforce the court order and compel the court reporter to file the transcripts or hold her in contempt. My appeal is therefore delayed due to the illegal and unconstitutional acts of the Illinois Appellate Court First District. The Illinois Supreme Court also has denied a motion for supervisory order to compel the court reporter to file the transcripts and compel the IL Appellate Court to enforce the order. The IL Appellate Court granted the Cook County States Attorney’s motion to compel me to pay for the transcripts and file them, instead of the court reporter. This is fraud upon the court as it violates a previous court order and is contempt as it also violates the United States Supreme Court holding (precedent) in a case where they ruled that indigent defendants are entitled under the due process and equal protection clauses of the U.S. Constitution to a free transcript for appeal. Illinois Supreme Court Rule 607 also mandates that indigent defendants are entitled to free transcripts filed with the court clerk by the court reporter. Therefore both the Illinois Supreme Court and Illinois Appellate Court are committing illegal acts. The Illinois Appellate Court has now vacated their order to compel me to file the transcripts as I moved for them to vacate order as they illegally granted the motion from the State two days too early according to IL Supreme Court rules. They also allowed me to file immediately (instanter) my response to the States Attorney’s motion to compel me to file the transcripts. This response clearly spells out the illegal acts of the IL Appellate and IL Supreme Courts in refusing to uphold previous court orders, and statutory and constitutional rights as previously decided by the U.S. Supreme Court. These are impeachable intentional acts by these corrupt and dishonorable judges. I hope the IL Appellate Court recognizes its mistakes and doesn’t just vacate the order to re-instate it several days later when the law allows them to make a decision. It is incumbent upon the IL Appellate Court to compel the court reporter to file the transcripts and hold her in contempt if she fails to do so.